— BugsInTheNews is a viewer-participant website. This article by Jerry Cates, first published on 5 February 2010, was last revised on 6 July 2012. © Bugsinthenews Vol. 11:02(01). The nine-banded armadillo (Dasypus novemcinctus) is a native of South America. As a result of its natural, far-ranging foraging behavior, combined with a lack of natural predators and a high rate of reproduction, the animal has managed to steadily enlarge its range. Though it has not yet infiltrated all of the areas that it can reach, it is expected to continue its range expansion until it inhabits all of the areas whose conditions favor its existence within the North American continent. FOOD FOR THOUGHT: Armadillos, skunks, raccoons, opossums, squirrels, bats, and other mammals often take up residence in the attics, basements, walls, and other portions of residential and commercial structures. Most home or business owners are not equipped to properly perform a mammal exclusion project at their homes or businesses. You may believe you are an exception to this rule, and it may be true. If, however, you don’t have the time or interest needed to (1) study all the legal/technical issues involved, (2) tackle all the mechanical habitat modifications, (3) obtain and properly use the protective gear needed to avoid injury from or contamination by the animal and its associated disease-causing organisms, (4) inspect for, find, and then seal all the ingress/egress ports in your home’s or business’s exterior, (5) clean up, disinfect, and remove the contaminants left behind by the animal, and (6) do all this within a reasonable time, you are no exception. In that case, what you need is a wildlife specialist with expertise in wild animal biology, removal, disinfecting and control. To find a qualified wildlife specialist in your local area (anywhere in North America), call Jerry RIGHT NOW at 512-331-1111. For millions of years, North America and South America were entirely separate continents. The lack of a land bridge connecting these large land masses resulted in the evolution of markedly different terrestrial species on each continent. Species distinctions between them were as striking, for example, as those of the disparate fauna found in Asia and Australia, as observed and documented by European explorers and scientists after Australia was rediscovered by the Dutch in 1606. Unlike the rather isolated continent of Australia, North and South America did not remain unconnected by land. Beginning some nine million years ago, the isthmus of Panama was formed as volcanic action raised up that portion of the ocean floor. Suddenly a bridge connected the continents of South America and North America together. And, as a result, armadillos, along with a number of other animals previously found only in South America, in unison with an equivalent number of animal species unique to North America, traveled steadily in opposite directions, making the trek northward and southward known today as the Great American Interchange. Had this not taken place, we would not have porcupines or opossums in North America, at least as “native” fauna, today. Nor would South America have coral snakes, rattlesnakes, cottontail rabbits, deer, otters, the gray fox, and a bunch of other terrestrial animals. The Great American Interchange peaked about three million years ago, but that is only part of the story and in truth the whole story is much more complicated than appears on the surface. Waves of predatory animals going south decimated many defenseless animals that had not evolved anatomical and behavioral defenses against them. Ditto on the northward movements. The mix of species in both spheres wreaked unimaginable havoc amongst the various interacting species, and along the way a succession of extinctions occurred, not only because of these migrations but also, among others, because of changes in weather conditions. The armadillo, for its part, appears never to have faced extinction at the hands, claws, or fangs of predators, as its native defensive behaviors and bodily armor more than met its needs when threats of predation loomed about it. This animal, as a result, at times moved north rapidly, and at other times slowed its advances, making great strides in certain periods, and retreating in others, governed more by the weather and abundance of insect prey than by anything else. By the late 1800’s, the latest migration northward distributed the species throughout central America, Mexico, and the Rio Grande valley of the United States. In the 1920’s the nine-banded armadillo was intentionally introduced by humans into Florida. In accordance with its natural behavior, it thereafter expanded its range from Florida northward and westward. Today its range extends into Oklahoma, Nebraska, Missouri, the gulf states, and northeast as far as New York. These were taken on a 300 acre ranch northwest of Hutto, Texas, on 17 Nobember 2011, using a Fugifilm FinePix F550EXR 16-megapixel camera. 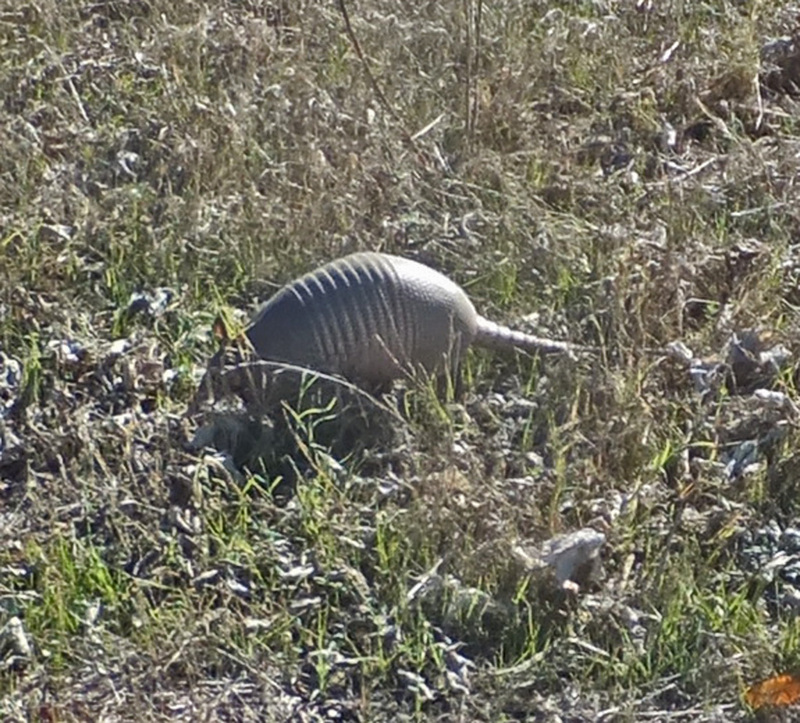 While driving the long driveway away from the ranch house, after a few hours of bat exclusion work, this armadillo was spied in a short-grass prairie. Stopping the truck, I readied the camera, took a couple of shots from about 50 feet away, then meandered slowly toward the animal, from the downwind direction. 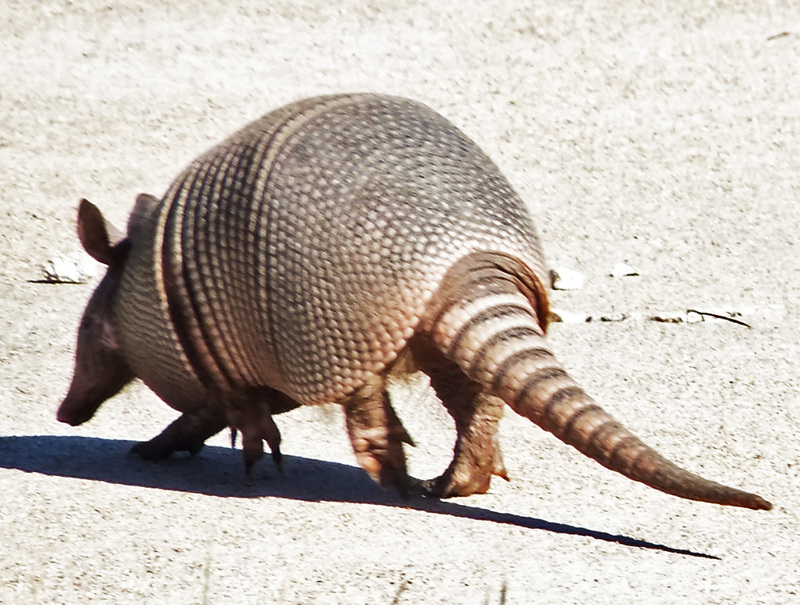 By walking slowly, and trying to be as quiet as possible, it was possible to walk to within six feet of the armadillo without being spotted or heard. This animal has poor eyesight, an excellent sense of smell, and highly selective hearing. When foraging, it tends to be so engrossed in its work that it is oblivious to its surroundings. Note the position of the ears in 102, 103 and 107. This arrangement allows the armadillo to pick up and discern sounds coming from the surface of the ground, and beneath the soil. That makes sense, inasmuch as the animal’s primary food source is terrestrial and fossorial (underground) insect life. 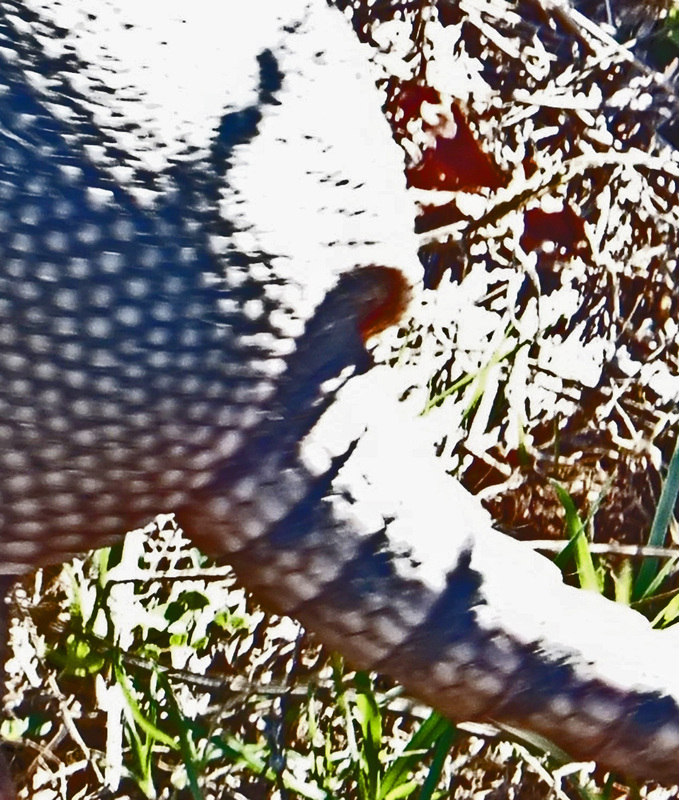 In residential settings, the most common evidence that armadillos have been foraging in a yard is the presence of small, angular, funnel-shaped holes in the turf. This animal — on hearing the movement of a grub or some other fossorial organism — quickly digs downward with one or both of its short front feet (in 103, the long sharp claw on the animal’s right foot, next to its face, is clearly visible), poking its long snout into the developing hole until its long, sticky tongue encounters the morsel of food and draws it into its mouth. The eyes are not shown in any of these photos, which alone suggests the animal does not use them as a primary means of recognizing threats. When I photograph wild skunks, raccoons, squirrels, or opossums, their eyes are nearly always seen, watching the camera, and he who wields it, with great intensity. 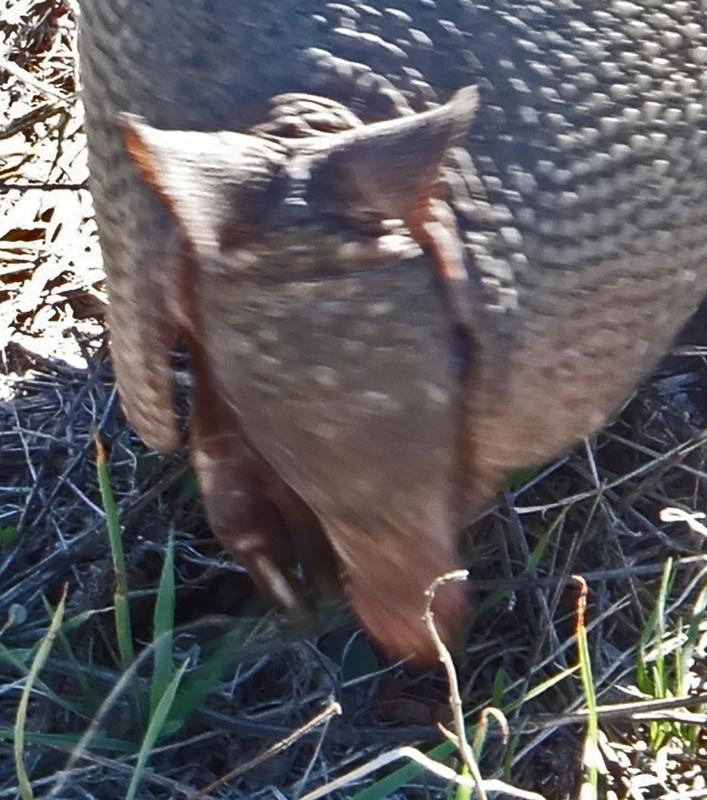 Once this particular armadillo noticed my presence (my boot snapped a twig), it jumped a few inches, and landed with its feet running. As I had stopped moving and did not appear to be a serious risk, it ran only a few feet away, then hesitated a few seconds before it resumed foraging, this time keenly aware of my presence, and thus dividing its attention between the soil it was digging around in and the unpredictable human now in its midst.. As it moved along, my following it around aroused its suspicions. As the evidence mounted that I was a stalker it grew more and more nervous, until finally taking off as a relatively fast pace, crossing the road and disappearing in the longer grasses on the other side. Because armadillos are endowed with a dorsal coat of armor, they have the luxury of focusing most of their attention on the ground before them, ignoring most of the wildlife in their midst while scurrying about finding insects to eat. Being mostly insectivores, they favor grubs (larval beetles), adult beetles, ant mounds, termite-infested wood, and fossorial worms. Studies show their sense of smell can pick up the scent of some insects through more than half a foot of soil. Their insectivorous diets are often supplemented with lizards, small snakes, anuran frogs and toads, the tender fruiting bodies of fungal outgrowths, roots and tubers, and the meat of dead animals they sometimes encounter while foraging. The armadillos as a group are therian mammals; i.e., air-breathing vertebrates that give birth to live young without using a shelled egg. They are further grouped with the infraclass Eutheria (placental mammals), and the superorder Xenarthra, a name crafted in 1889 by the American paleontologist Edward Drinker Cope. He combined the Greek words ξενος– , “xenos-” = strange + -αρθρον, “-arthron” = joint, to mean strange-jointed. This is a reference to the unusual articulations in their vertebrae, and the fact that the vertebrae are attached to the bony plates of the animal;s exoskeleton, quite unlike those found in other mammals. 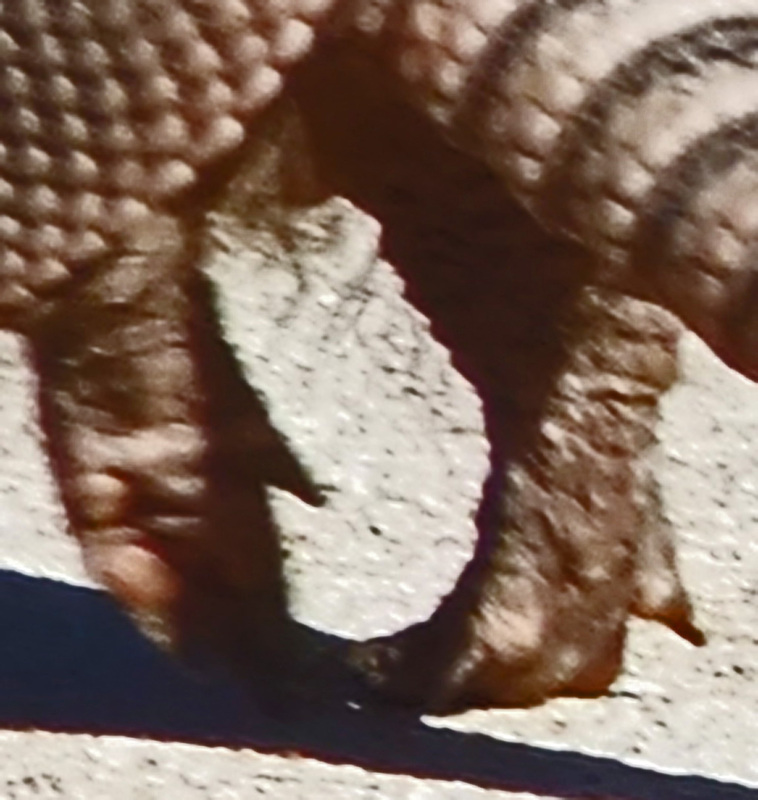 In the armadillos, the dorsal body is clothed with plates of dermal bone that is overlain with overlapping epidermal scutes, or scales; the vertebrae are attached, internally, to the dorsal plates. Today the only native members of the superorder Xenarthra are the anteaters, tree sloths, and armadillos — all of which are placental mammals — and all of whom are native to the Americas. Besides the unusual morphology of their vertebrae, xenarthrans exhibit the lowest metabolic rates of all the therians,and males of this superorder lack external testicles.Armadillos make use of their low metabolic rates to survive without breathing for long periods of time while their snouts are buried in soil foraging for insects and while digging burrows. They are able to take advantage of this faculty while underwater — running along river and creek beds while submerged — where they can remain up to six minutes and, by so doing, cross relatively wide watercourses unseen by terrestrial predators. The high density of their bodies enables them to sink to the bottom without difficulty. When necessary to cross wider watercourses than can be traversed underwater, they are able to inflate their intestines with air, enabling their bodies to float. The superorder Xenarthra is subdivided into three orders, one of which — Cingulata (from the Latin word cingulum, “girdled” — is divided into three families. One, Dasypodidae (Gr. “shaggy-footed”), the armadillos, presently contains some ten genera of approximately 20 species. 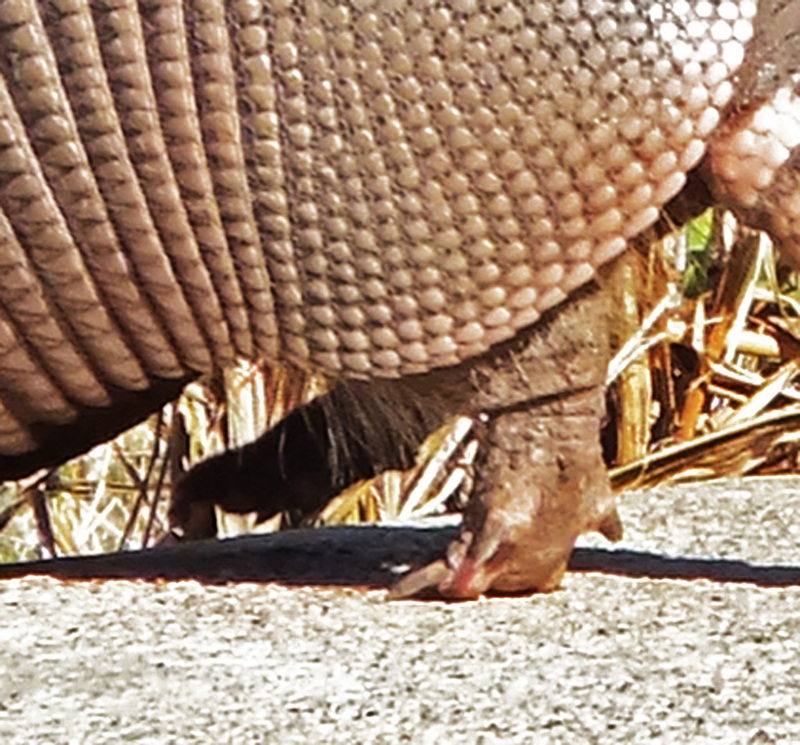 Armadillos have short legs with five-clawed toes on the hindfeet, and three to five (for D. novemcinctus, four) heavy claws on the forefeet, whose sharpened tips are well-suited for digging. The nine-banded armadillo burrows in soil around creeks, streams, and in residential neighborhoods where they forage for food. These burrows are only wide enough for the armadillo itself to pass, and typically — for D. novemcinctus — are dug from two to 12 feet deep, and up to 22 feet long. A single armadillo may construct up to 12 separate burrows within their foraging range, the extent of which can be as large as 12-15 acres. D. novemcinctus mates in North America between July and August. A single egg is fertilized from the mating that takes place in a given year, and that egg divides to form a litter of, in most cases, four identical young (sometimes as few as two or three, rarer still as many as six). The zygote is not implanted immediately after mating, but is typically delayed until November, and — if conditions are not considered right by the female for rearing young — can be delayed an additional four months. Once the egg is fertilized, a gestation period of four months commences, terminating with the live birth of young with their eyes opened. The female has four teats, which serve to feed the pups for four to five months, when they are weaned. The pups mature sexually after 12 months. The typical lifespan of D. novemcinctus is reportedly 12-15 years in the wild, and — contrary to the life esperiences of captive opossums, raccoons, and skunks — they tend to live shorter lives in captivity. Captive armadillos are typically kept in enclosures that restrict their abilities to dig deep burrows, and are fed a diet much less varied than would be the case in a true wilderness setting, both of which likely contribute to conditions of poor health.. The top and sides of the body are covered by a thick protective carapace made of ossified dermal scutes and covered by a leathery skin. The anterior carapace is covered by an immovable scapular shield that extends from the head to the shoulders. This is followed by 8-9 flexible bands covering the mid-body. Beyond this is a posterior immovable shield, which begins at the back legs and ends at the tail base. The long, bony tail is comprised of approximately 14 segments, plus a tip of variable length. 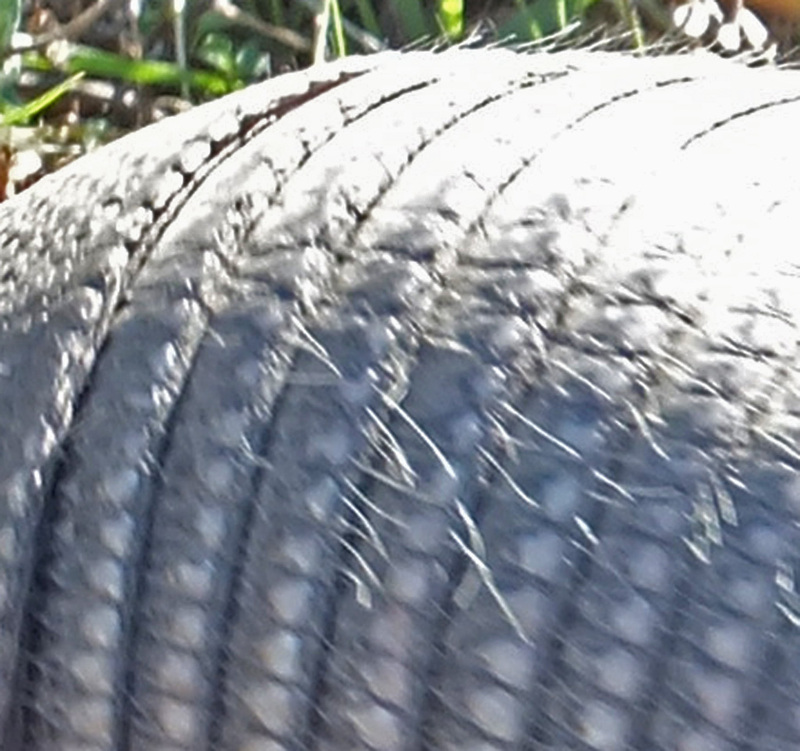 Nine-banded armadillos also have relatively large, thin ears protruding from the top of the head. Except for humans, the nine-banded armadillo is the only highly endemic natural host of Mycobacterium leprae, one of two bacteria responsible for producing the disease known as leprosy or Hansen’s Disease. Leprosy was first discovered in wild armadillos in 1975, though it wasn’t until 1983 that the sylvan agent was confirmed to be identical to the M. leprae infecting humans. Studies show that M. leprae is prevalent in wild armadillos found in certain parts of Louisiana and Texas, but rare or absent elsewhere. The origin of the infection, its geographic range, and the risks posed to humans is subject to speculation (Truman 2005). Beyond the risks to humans exposed to leprosy through contact with infected armadillos, the ability of these animals to incubate M. leprae in their bodies has made them useful to laboratories studying the disease. Though scientists have sought to cultivate M.leprae in artificial bacteriological media, all such efforts have failed. After Hansen identified M.leprae as the causative germ of leprosy in 1873, he experimented unsuccessfully with a variety of animal en vivo models. Some 85 years later, others succeeded in transmitting and reproducing the microbe in the footpads of laboratory mice. Not long afterward, in 1971, it was discovered that the nine-banded armadillo, when injected with M.leprae, would become infected and, over the succeeding 18-24 months, would develop a generalized form of lepromatous leprosy. Today this animal serves as the primary animal model for experimental leprosy research, which is not surprising, given that they are the only immunologically intact species, which regularly develops lepromatous leprosy (Vijayaraghavan 2000). The presence of armadillos and their feces poses moderate disease risks to humans and their pets throughout their range, as they serve as hosts for a number of infectious parasites. They pose a potential risk of exposure to the leprosy bacterium, M. leprae, notably in riparian and coastal areas of Texas and Louisiana, as well. These strongly suggest that reducing or eliminating their foraging activities within areas of human habitation is advisable. Beyond the risk of disease, these animals have the annoying habit of damaging lawns and landscaping. 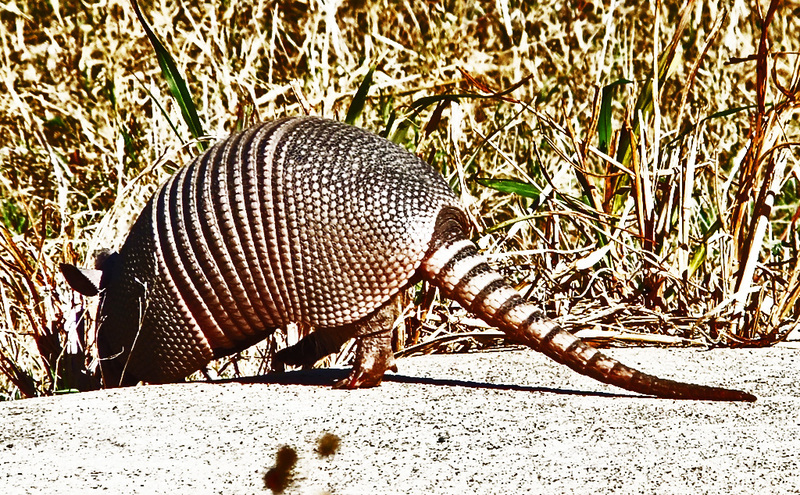 It is not unusual for homeowners living within the range of these animals to have their yards regularly torn up by armadillos. 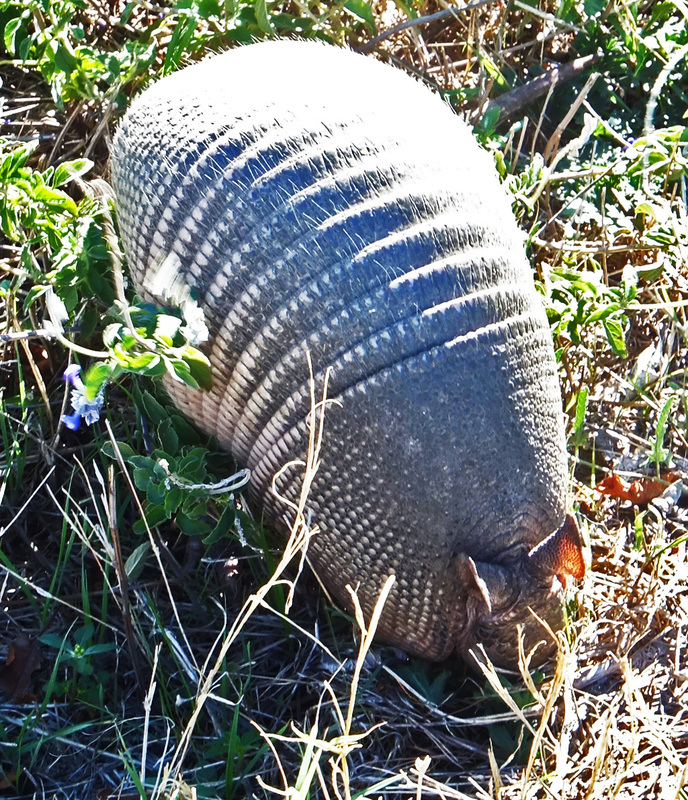 Inspections of yard damage from armadillos generally confirms the presence of fossorial beetle larvae, in the yard soil, as the precipitating factor. If these larvae are present, armadillos will almost certainly dig up the yard to find and eat them. But, absent such larvae, armadillo damage in residential yards is practically non-existent. Trapping the offending armadillos and either euthanizing or relocating them does not solve the problem, as the surrounding environment contains too many of these animals for any trapping program to have an effect on the endemic population. 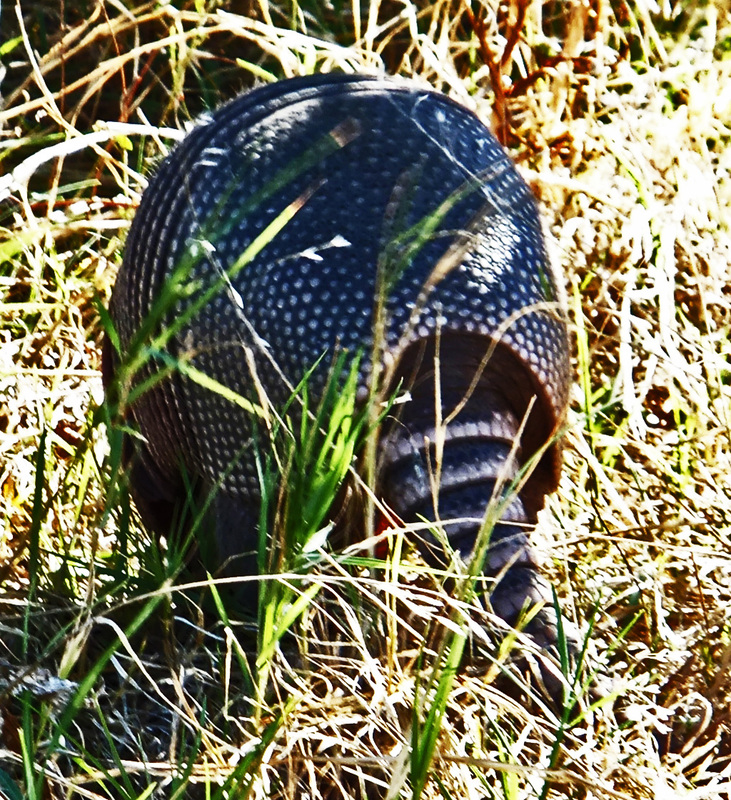 The solution to yard damage from armadillos lies, instead, in eliminating and/or masking the presence of the fossorial beetle larvae that attract the armadillos to the yard. 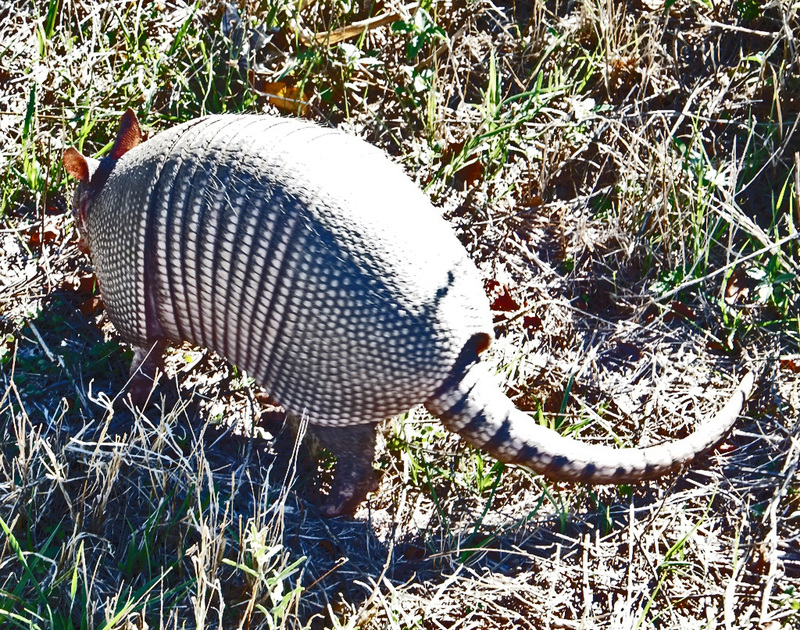 Treating armadillo-damaged yards with pesticides is a common solution, though recent history shows that solution often fails to work, and — even when it works — often creates more problems than it solves. Unfortunately, pesticides labeled for beetle larvae tend to have broad insecticidal effects that destroy all the insect life in a treated yard. After each treatment, the yard is vulnerable to all the noxious insects that, except for the absence of their natural predators (which the pesticide killed along with the beetle larvae), would be unable to survive there. This effect is exacerbated by the tendency, over time, for targeted beetle larvae to develop resistance to pesticides, at which point they cease to be affected by the treatments. During periods of drought and high diurnal temperatures, natural saturating rainfalls are not available to soak pesticides into the deeper strata of the soil where the beetle larva spend much of their life cycle. As a result, during extended droughts even beetle larvae susceptible to pesticides are able to escape control. Because of all the above disadvantages associated with the use of pesticides, many authorities, including the author of this article, recommend against using pesticides of any kind, substituting instead habitat modification techniques that lead to PestAvoidance conditions. Armadillos only dig into the soil when they are able to positively discern the presence of larvae, partly via their sense of smell, and partly by hearing the sounds made by the larvae as they burrow through the soil. 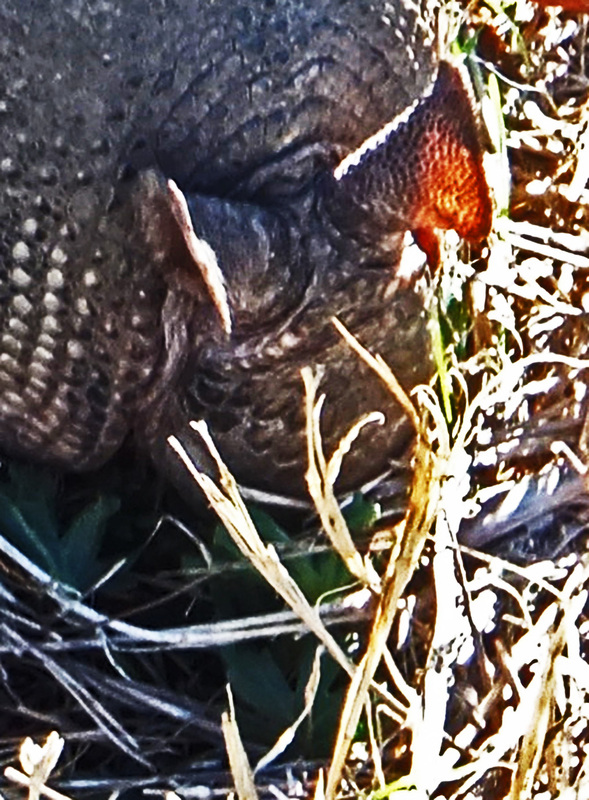 Barring larval smells and sounds in areas where effective habitat modification techniques are in place, armadillos continue searching without digging until — outside the habitat-modified area — larvae are once again detected. 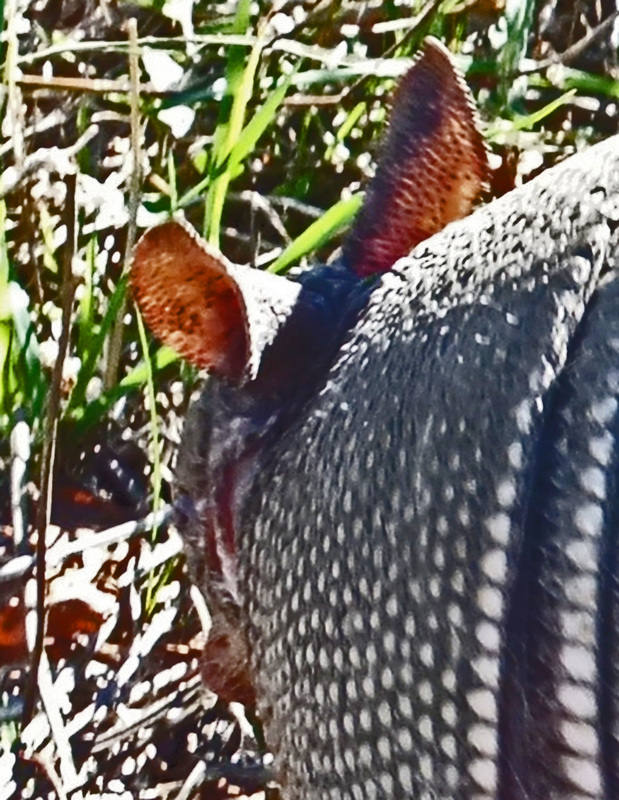 Over time, after failing to find beetle larvae in the habitat-modified area, armadillos tend to visit those areas less often or not at all, recognizing from the tell-tale signs of the habitat modifiers involved that the likelihood of detecting food there is practically nonexistent. Habitat modification approaches are less expensive, less time-consuming, and less damaging to the environment than pesticides. They also avoid creating pesticidal resistance in pest populations, and are more effective and long-lasting. To top things off, such approaches are better able to produce broad-band effects that lead to a nurturing, attractive environment for the human occupants and their pests. This is true because, by emphasizing PestAvoidance, they address all the environmental pests that affect a residential or commercial yard, and the structures and/or homes around which such yards are situated. During calendar-year 2012 EntomoBiotics Inc. will be conducting a series of studies on armadillo exclusion and control using habitat modification techniques alone. Select yards, known to have experienced armadillo damage during 2011, will be monitored monthly for armadillo and fossorial beetle larvae activity, to determine the effectiveness of the use of habitat modification as a means of eliminating the presence of armadillos and the lawn damage they typically produce. Leffingwell, Lois M., and Susan U. Neill. 1989. 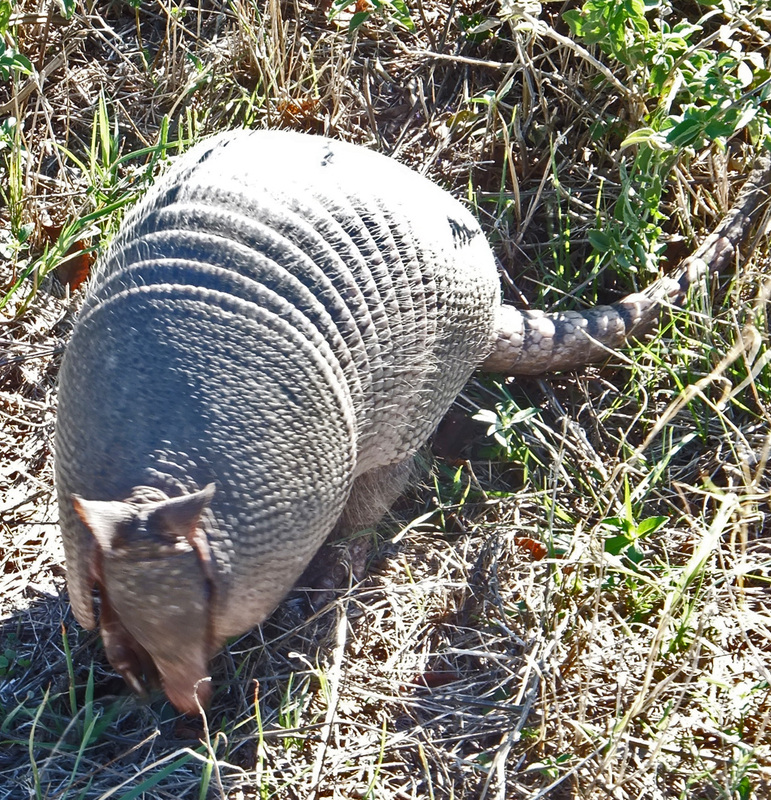 Naturally Acquired Rabies in an Armadillo (Dasypus novemcinctus) in Texas. Journal of Clinical Microbiology, 27(1):174-175. Loughry, C. M., et al. 2002. Patterns of anatomical damage in a population of nine-banded armadillos Dasypus novemcinctus (Xenarthra, Dasypodidae). Mammalia, t. 66(1):111-122. Mengak, Michael T. 2004. Ninebanded Armadillo (Dasypus novemcinctus). USDA National Wildlife Research Center. Mertins, James W., et al. 2011. Echimyopus dasypus Fain et al. (Acari: Astigmatina: Echimyopodidae) from a nine-banded armadillo, Dasypus novemcinctus L. (Mammalia: Dasypodidae) in Florida, USA. Systematic & Applied Acarology 16:252-254. Smith, P. 2007. Nine-Banded Armadillo (Dasypus novemcinctus, Linnaeus 1758). Fauna of Paraguay. Truman, Richard. 2005. Leprosy in wil armadillos. Leprosy Review 76:198-208. Vijayaraghavan, R. 2009. Nine-banded Armadillo Dasypus novemcinctus Animal Model for Leprosy (Hansen’s Disease). Scandinavian Journal of Laboratory Animal Science 36(2).